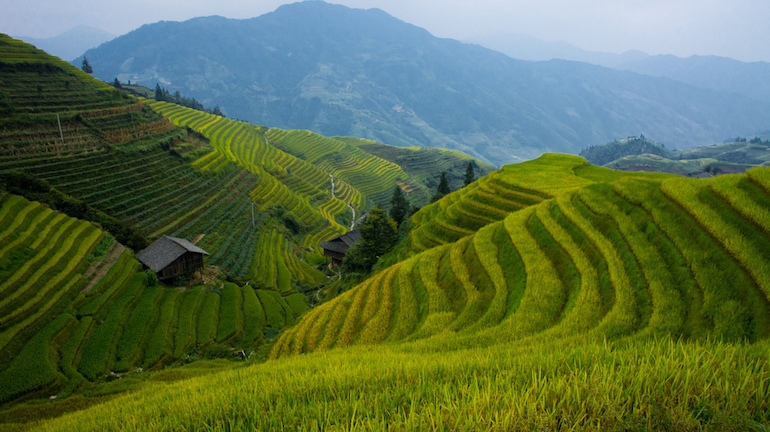 Terraced fields of cultivated rice in China. Photo by oarranzli via Flickr. Rice is one of the most important food crops on earth. Like many other plants, the genome of this critical global species is dominated by transposable elements—selfish genes that multiply themselves to the detriment of their host. In the June issue of G3, Zhang and Gao analyze the genomic long terminal repeat (LTR) retrotransposon content of the two species of cultivated rice and their six closely related wild relatives. They find that these LTRs have multiplied in a lineage specific manner and suggest that the unique activity of retrotransposons in these rice species has contributed to their diversification and isolation. The eight rice species included in this study present an excellent opportunity to investigate the dynamics of LTR retrotransposons during speciation. The common ancestor of this group lived only 5 million years ago, and each member has whole genome sequence data available. For each species, Zhang and Gao extracted the LTR retrotransposon sequences from each genome and sorted them into 790 families based on homology. For very highly similar LTRs, they were able to estimate genome abundance from the sequencing read count. They then used homology between LTR retrotransposon families to estimate the time of their origin, placed in the phylogenetic context of the rice species group. Overall, they found that the LTR retrotransposon content of the genomes varied greatly among different rice species and that genome size varied due to repeat content. However, almost all of the families with very high copy numbers were found in all of the species, indicating they were present in the most recent common ancestor. It is possible that even the newer LTR retrotransposon families were present in the ancestor, but as these sequences are very fast evolving, they may have diverged past the point of recognition. Extremely highly amplified LTR retrotransposon families also generally have much shorter periods of activity than families with fewer overall sequences. There is clear evidence that lineage specific LTR retrotransposon activity has shaped the genomes of these groups. Certain families of transposable elements have high copy numbers in only one or a few closely related species, indicating that bursts of retrotransposon activity occurred after the split between these groups. Notably, there is also a difference in LTR retrotransposon content and activity between domesticated African rice and its wild progenitor, which split about 260,000 years ago. Such differences between lineages may indicate that LTR retrotransposon activity is associated with changes in environment or life history. Certainly, they have helped rapidly shape distinct genomes in these diverging species.